Hey guys. What's going on? Picked up any portable storage device lately? Maybe a flash-drive, or hard disk maybe? Over the years we have seen the evolution of portable devices! Back in the 1970's , this is how a Hard Drive looked like, with just 250 Mega Bytes of space! Can you imagine that? From hard disks this big, to micro-SD cards of an inch, we have seen so many drastic changes in portable storage devices. 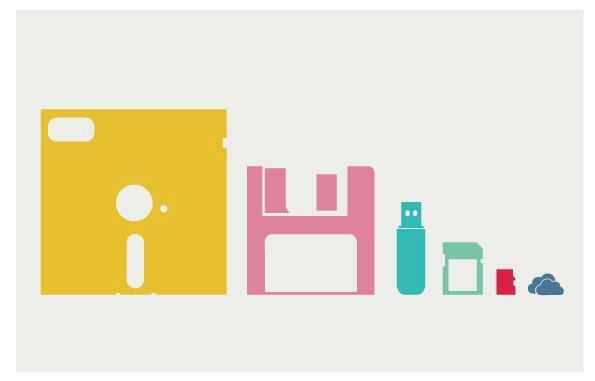 I think one of the first portable devices we used was the Floppy Disk! And when I was a kid, I used to use it for transferring MS Office documents and stuff. And I still remember the times I broke Floppy Disks to see the brown film that runs through it. Lol! Then we saw the Compact Disks/Dvd's. It was only until, 2 years ago, that I believe most people stopped using CD's. The introduction of portable mp3 players, and the revolutionary iPod's from Apple, people actually stopped using CD's. And in today's life, there is not a single day I have used a CD/DVD! The introduction of iTunes, has completely changed the music industry, changing how people download their songs instead of buying a CD from a store. And the sales are recorded not by counting the records sold, but counting the number of digital downloads. In the recent years, we saw the arrival of difference flash storage devices, like the 'Pen'-drive, SD card, Micro-SD cards. And most of us use these in our day to day lives! And now guys, its coming down to 'Cloud' storage! Company's like Dropbox, Evernote, Apple, and also, Microsoft have made it possible for us to store all our important data on a cloud, from which we can download it , anywhere in the world, anytime! Well, most of the people are still using them Flash drives, but they will soon be saying Goodbye to them too! Today, I came across this picture from Microsoft, which encouraged me to write this post! Blackberry Bold 9900 Black OR White? !